Kummoona, R., Jassim, E.A. Distraction Technique of Lower Jaw on Rabbit, Experimental Studies Research. (2017) J Stem Cell Regen Biol 3(2): 158- 162. © 2017 Kummoona, R. This is an Open access article distributed under the terms of Creative Commons Attribution 4.0 International License. In this piece of research, nine New Zealand Rabbits of one year of age weighted 3.5 kg were subjected to experimental study by distraction technique for elongation of the mandible. Distraction was achieved by using bilateral distractor designed for hand bone lengthening apparatus and adjusted by Tran’s fixation. Kirschinar wire of 1.5mm passed through mandibular body, rhythmic distraction of both corticomized fragments at a rate of 1 mm/day at a rhythmed of 0.5 mm twice daily preceded by latent period for 7 days and distraction period for 10 days, postoperatively systemic antibiotic of pen strep (penicillin streptomycin, 1 ml/10 kg IM) prescribed for 6 days. Thesegments were hold by external fixator for 6 weeks till consolidation phase completed and mandibular lengthening achieved of about 10 mm. 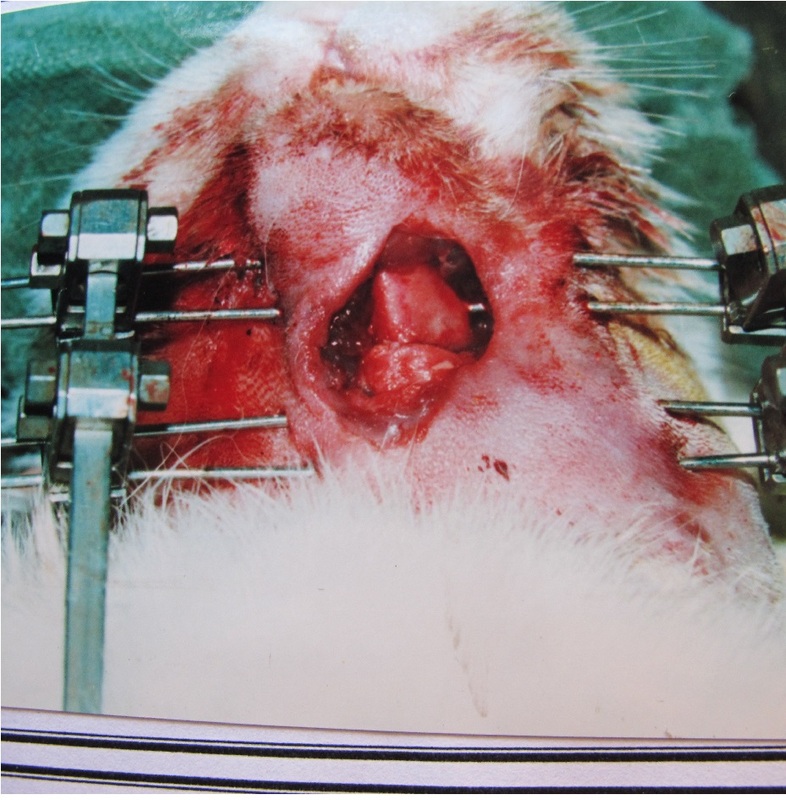 The result of this research mandibular lengthening 10mm achievedin 3 Rabbits, pin side infection observed and controlled by idoformegauze in 2 Rabbits, dropping of lower jaw and open bite noticed in 2 and one Rabbit passed. No deviation of the mandible was noticed and all animal were able to open and close their mouth without any side effect on masticatory process. This research was found quiet interesting and demonstrated the cytological changes associated with distraction technique with the formation of granulation tissue containing with mesenchymal stem cells derived from periosteum and bone marrow and growth factor during latent period which played an important role in bone formation during consolidation phase. And we believe its value to humans for managements of deformities of the mandible and facial skeleton. Distraction is defined as the process of generating new bone by stretching distraction osteogenesis, traction on living tissue can stimulate and maintain regeneration and growth by inducing proliferation of precursor cells. Human body has an enormous regenerative ability and distraction osteogenesis (DO) which takes the advantages of this regenerative ability to induce the regeneration and remodeling of bone, cartilage, nerve, muscle, blood vessels and the skin. 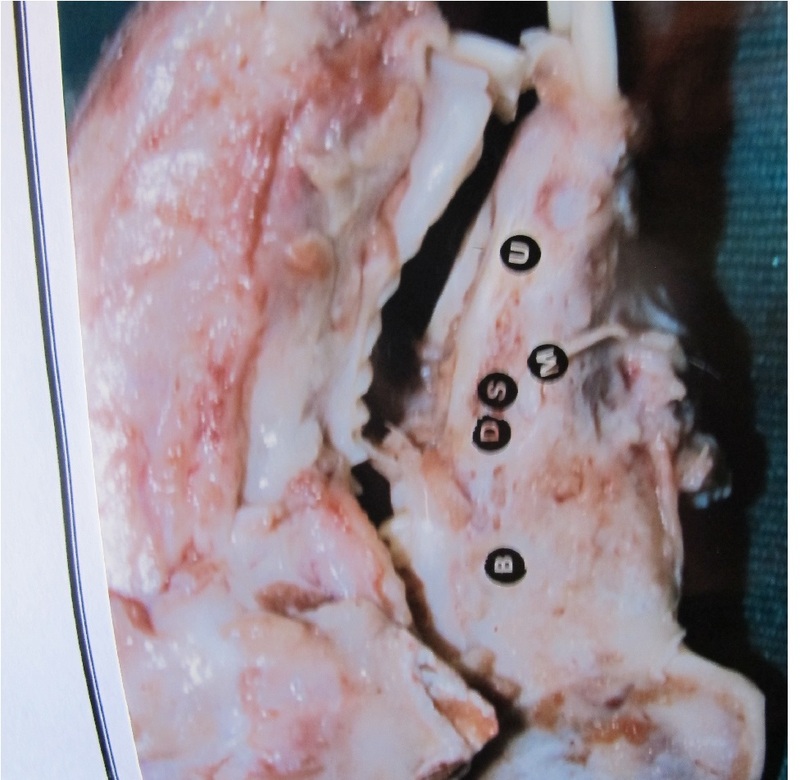 Distraction is defined as the creation of neo -formed bone and adjacent soft tissues after gradual and controlled displacement of fragment bone and adjacent soft tissue after gradual and controlled displacement of bone fragment obtained by surgical osteotomy, by this technique we can increase bone volume by gradual traction of a fracture callus formed between osteotomized bony segments. Distraction is achieved through three main phases, first phase is the surgical phase, the second phase is latent period phase and the third phase is the consolidation phase. Distraction as a technique was advocated by genius Russian orthopedic surgeon, Illizarof, (1988) for elongation of lower limbs of children and this technique was applied for elongation of the mandible in children by McCarthy, (1995). Distraction may be applied as callus distraction is a new surgical technique which makes it possible to create new bone by elongation of bone.It was originally designed by orthopedic surgeons Illizarof to extend long bones but has been proved useful for elongation of the mandible as well as other bones of the facial skeleton. Some authors believe that by following callus distraction it now possible to treat severe jaw anomalies and also to treat bone defects in the jaws by distraction without using bone transplantation or bone graft. Distraction osteogenesis (DO) is also called callus distraction with deferent names such as, callotasis and osteodistraction which is a process used and applied in orthopedic surgery and oraland maxillofacial surgery to repair skeletal deformities and also in reconstructive surgery. The technique is achieved by cutting the cortex and slowly separating bone, allowing bone healing mechanism to fill in the gap. Originally distraction was used to treat unequal lower limb length, but since 1980 McCarthy used this technique to treat cases like hemi facial microsomia and small chin or micrognathisim, others used it to treat craniofrontonasal dysplasia, craniosynostosis as well as airway obstruction caused by gloosoptosis with micrognathsim featured in Pierre Robin Syndrome. The surgical technique was divided into first osteotomy phase of the cortex as exterior surface only in the hard tissue or completely as surgical phase. The device fitted at this time, the second phase is the latent period which last seven days; in this stage no activation of the device which is mounted to the bone in each sides to allow early stage of healing and formation of mesenchymal stem cells and slowly separating the bones and formation of granulation tissue in the gap created. The desired possible length required within 3 - 7 days can be achieved, then consolidation phase fallowed. Distraction device operated manually by twisting a rod through a rack and pinion system by slight rotating, it can separate the bone, the rate of separation should be carefully determined, going too quickly can cause nonunion and unstable connective tissue instead of bone and going too slowly can lead to premature union. The rate of distraction measured by millimeter per day in 2 step, the frequency of steps and the rate of device movement is called (Rhythm). There are two phases required, the first phase is the choice of animal model and the second choice is the experimental studies. There are certain requirements for choosing the animal Rabbit as animal model; the animal should be chosen which allow a giving close comparative study to human tissue reaction. In order to get the following points from our experiment we have to know and understand, the clinical difficulties we might face during the technique been used in the experiment, the effect of the technique on the masticatory requirement of the animal, radiographic records of the experiment and radiographic changes that occurred post experiment and histological studies of tissue reaction at the end of experiment. Further requirements, the animal should not carry any disease that might be transmitted to human, the cage of animal required hygienic requirements, the researchers should be prepared to be sterile with surgical gown, masked, head cap and cloves with special sterile shoes during work in the animal lab and other necessary steps to be carried for the safety of the animal and researchers., Kummoona, (2015). The advantage of Rabbit as animal model chosen as a very good animal model, it is cost cheaper than other animal model like monkey, healthy animal and friendly, vegetarian and cleaner, does not transmit disease and we can keep few rabbits in one cage. The animal model were used in this research, these animals were used for distraction technique for elongation of the mandible and to study the boney structural changes that achieved by distraction through postmortem as macroscopically and histological changes of the distracted area. We used rabbit in this experiment as a good animal model because it is available, its coast cheap, clean and vegetarian and nice looking animal and its useful to apply surgical procedures designed for humans and we can keep many rabbits in one cage. 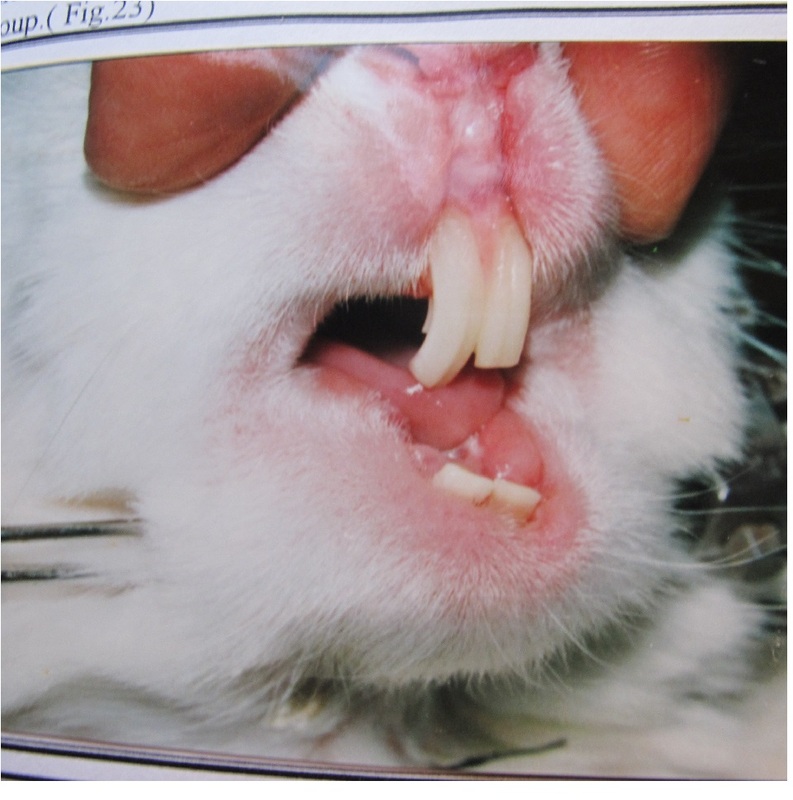 Mandibular lengthening were performed by using nine Newzeland Rabbits of one year age and weighted three of them 3.5 kg the animals were free from species pathogen, were dipped and vaccinated two weeks before surgery, anesthetic procedure carried out under ketamine IM of 30 mg/kg and Xylazine IM of 6 mg/kg of body weight with xylocaine 2 % with adrenaline of 1/80000 subcutaneously. Distraction of lower jaw achieved by using bilateral distractor designed for hand bone lengthening apparatus was adjusted by trans fixation kirschiner wire of 1.5 mm, was passed through both mandibular bodies, rhythm tic distraction of both corticomized fragment were carried out at a rate of 1 mm/day at a rhythm of 0.5 mm twice daily preceded by latent period of 7 days and the distraction period for 10 days. Immediate post operatively antibiotic of pen strep(penicillin streptomycin) of 1 ml/10 kg IM once daily for 6 days, and the segments hold by external fixator for six weeks till consolidation completed, bone regeneration evaluated radiologically. 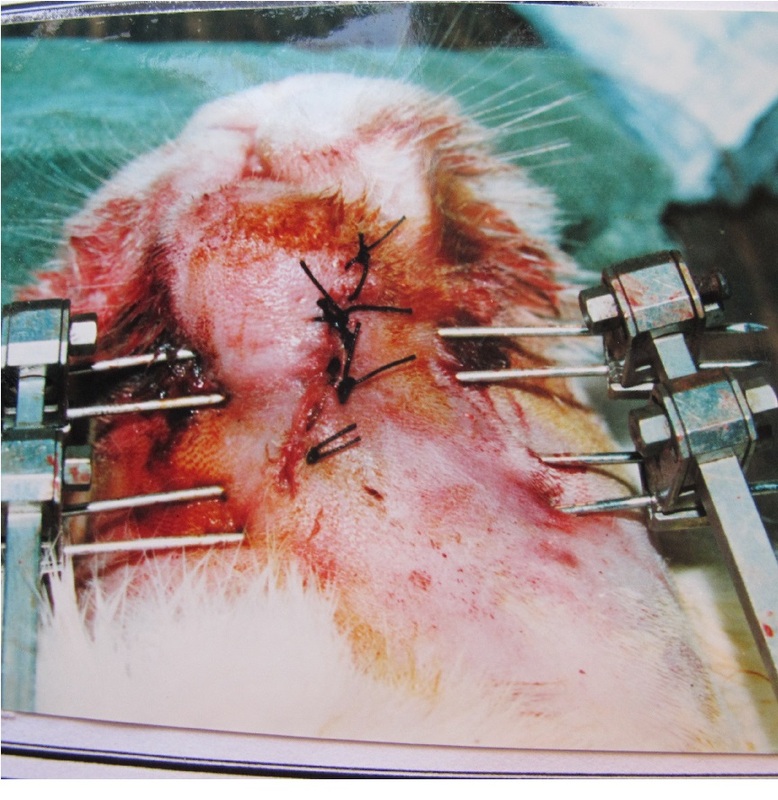 Figure 1: Photograph, showing distraction device on both side of the mandible on Rabbit and osteotomy cut. 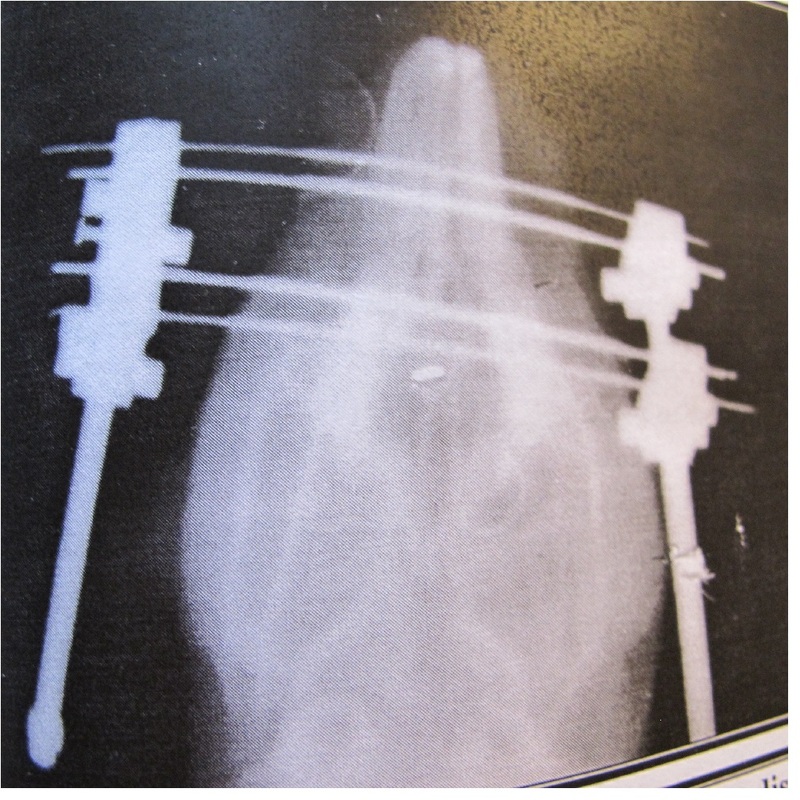 Figure 2: Photograph of Rabbit with distraction device after closure of the distraction osteotomy incision. 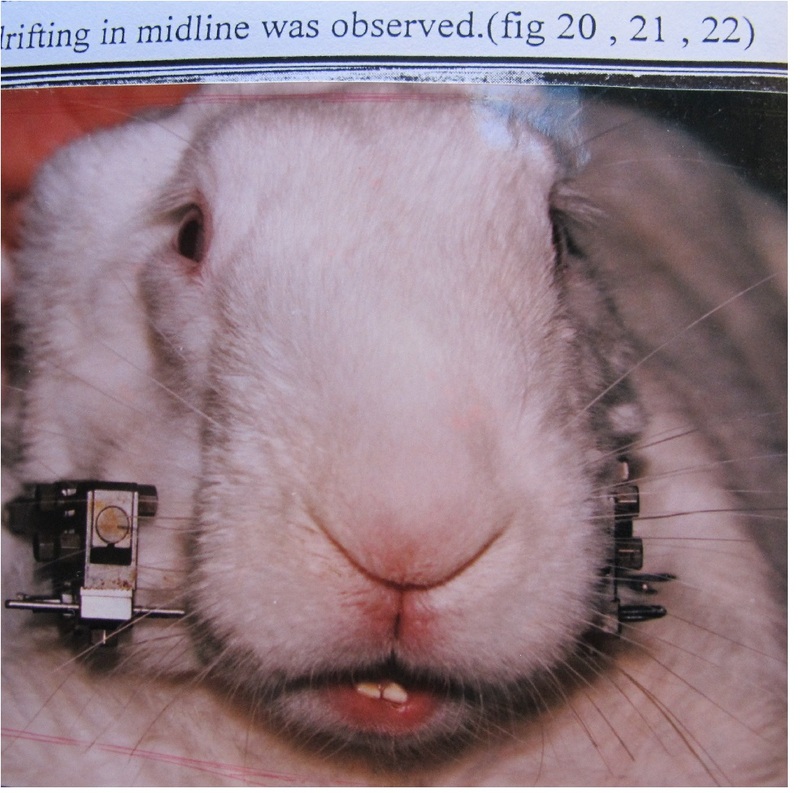 Figure 3: Photograph of Rabbit showing distraction device during distraction period. Figure 4: Radiological picture of distraction apparatus. Figure 5: Photograph showing elongation of lower jaw by distraction technique. Figure 6: Post mortem specimen showing distracted area of lower jaw of Rabbit (D) with new bone formation and elongation of the mandible (M), mental nerve. The histological examinations of distracted jaw were done after 6 weeks by longitudinal histological sections, were stained by Hematoxylin and Eosin (H&E). (Figure 7, Figure 8). The distracted zone showed mature bone trabeculae in fibro vascular stroma and heavy cells of mesenchymal stem cells with heavy fibroblasts formation oriented with the direction of tension-vector and also blood vessels oriented in the same direction. Newly formed trabeculae lined by chain of osteoblasts were noticed. Figure 7: Histology of distracted area stained by (H&E X20) showing nice and healthy granulation tissue with mesenchymal stem cells and heavy fibroblasts oriented in the same direction of distraction forces. 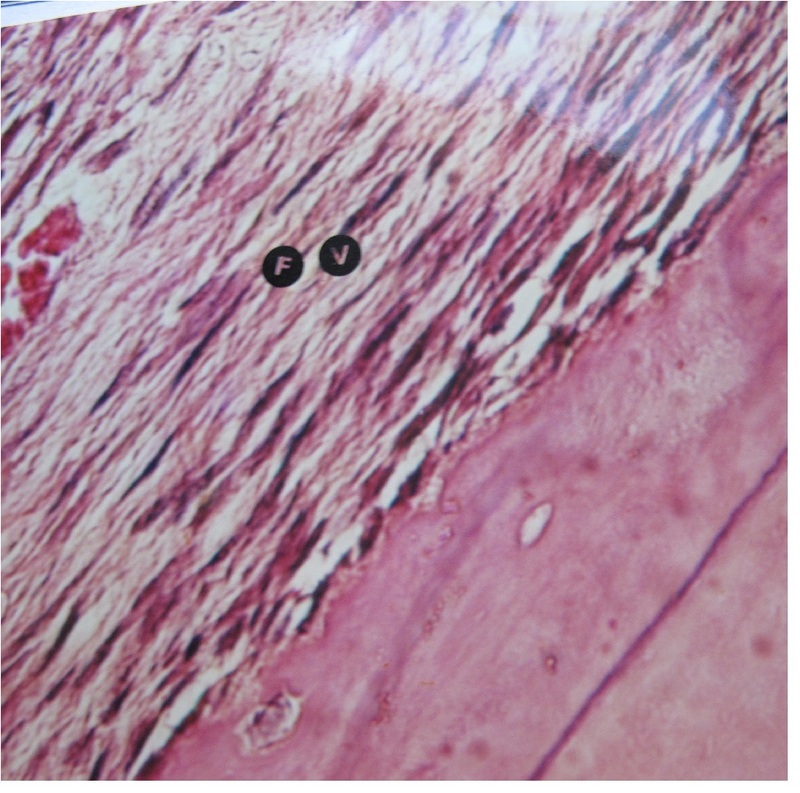 Figure 8: Histology of distracted area after consolidation of distraction phase showing excellent bone formation with trabeculae (H&E X10). Distraction is widely practiced by orthopedic surgeons for elongation of bones in children after illizarov and also practiced in maxillofacial skeleton and the mandible since 2 decades, McCarthy succeeded in elongation of the mandible in first arch dysplasia syndrome. Illizarov first became interested in orthopedics and bone reconstruction because of many of his patients were soldiers returning from the front line battles of world war 2 and many of the patients suffered severe fractures and had to endure lengthy treatment; cast and skeletal traction being the only methods generally used. Illizarov continued his research into improving the treatment of fractures and developed the idea of an external fixator ring with cross wires to improve the stability. Although the illizarov device was met with scepticisim, similar devices began to emerge Illizarov & Rozbruch, (2007). Illizarov developed his on method which was supsupported by biomechanics and basic science and he put the basic principle for treatment of fractures by preservation of blood supply, preservation of osteogenic tissue, complete anatomic reduction, and stablefixation with functional activity of the muscles and joints and early patient’s mobilization. Illizarov discovered that other tissues such as blood vessels, nerve and skin were able to regenerate during gradual distraction and he made his (Low of Tension Stress) theory, which shows that under the effect of slow and gradual distraction, of bone and soft tissue would regenerate. The mechanism of illizarov fixator is to stimulate bone growth by distraction osteogenesis and his idea, which is the pulling part of bone to stimulate new bone formation and growth. The processes of generating new bone by stretching distraction osteogenesis, theoretically similar and applied to general principles, traction on living tissue and maintain regeneration and growth by inducing proliferation and differentiation of precursor cells. Previous literature did not mention the biological changes that occur in the gap created by osteotomy of the bone site desired during latent period which is the key factor in distraction process and formation of new bone. Bone regeneration by distraction is highly complicated and organized process; through our research. 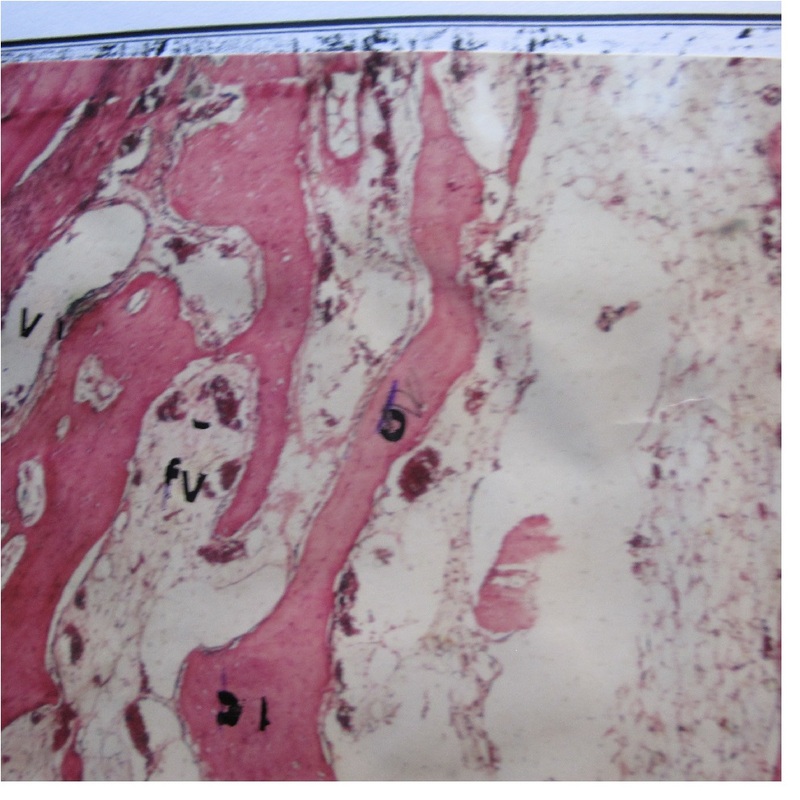 We found the histological studies revealed and demonstrated by our experiment that bone regeneration based on pattern of membranous ossification preceded by formation of granulation tissue and mesenchymal stem cells derived from periosteum lining and bone marrow by influence of growth factor for formation of new bone, muscles and skin. The previous biological changes occurred during latent period. The parameter of latent period, ideal distraction rate, rhythm and duration of consolidation phase as established by illizarov are vital factors for success of distraction technique in tubular bones of extremities and other bones of facial skeleton. From our study research we concluded, distraction could be unlimited but two factors with great effect on distraction, first theperiosteum with soft tissue damage or restriction of muscular function and the second factor is suboptimal bone formation with fibrous tissue formation induced by rapid distraction. Further factor may effect on distraction was infection and that controlled by systemic antibiotic and locally by application of iodoform gauze around pin insertion greatly affected and prevent spread of infection. Our studies demonstrated that bone lengthens was applicable to the human mandible, the length of the mandible in Rabbits by distraction is achieved through applying an external fixator with constant external force proved as a” GOOD TECHNIQUE”. 1. Kummoona, R. Facial deformities and correction of normal variation of jaws relationship. (2017) J Craniofacial Surg 28 In Press. 2. Illizarov, G A. The principle of Illizarov method. (1988) Bull Hop Jt Ortho Inst 48(1): 1-11. 3. McCarthy, J.G., David, M.D., Staff Enberg, A., et al. Introduction of an intraoral bone lengthening device. (1995) Plastic Reconstructive Surg 96(4): 978-981. 5. Nord, P.G. A new surgical method: Lengthening of jaw bone by distraction technique. (2011) Lakartidningen 98(22): 2708-2712. 6. Kummoona, R. Requirements of animal models. (2014) Cited in Disease of the temporo mandibular joint, surgical reconstruction, clinical and experimental studies, Book Science publication groups New York. 7. Illizarov, S., Rozbruch, S. Limb lengthening and reconstructive surgery. (2007) New York informa health care. 8. Illizarov, G.A. The tension stress effect on the genesis and growth of tissues: Part II. The influence of the rate frequency of distraction. (1989) Clinical Orthopedics and Related Research 239: 263-285.